For those of us who grew up with comic books in the ’60s and ’70s, the current batch of super-hero series on the CW have proven to be great fun. They’re constantly referencing classic storylines that we remember so well. Case in point: the four-part Crisis on Earth-X crossover series that linked Supergirl, Arrow, The Flash and Legends of Tomorrow and aired over two nights last fall. I was honored to moderate a clip-filled Q&A that featured composers Blake Neely, Nathaniel Blume, Daniel James Chan and Sherri Chung, examining in depth how they went about scoring this grand-scale TV epic. The Society of Composers & Lyricists sponsored the event. 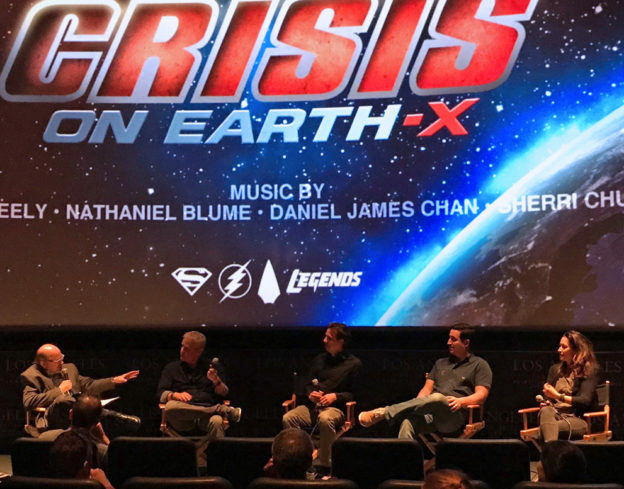 This entry was posted in and tagged Blake Neely, Crisis on Earth-X, CW superhero shows, Daniel James Chan, music on superhero shows, Nathaniel Blume, Sherri Chung, Society of Composers & Lyricists on June 13, 2018 by Jon Burlingame.